Trump isn’t alone. Americans love their gas-guzzling trucks again. Americans love big trucks again. Americans are opting for pickups and SUVs over cars at a record rate, as those larger vehicles now comprise over 60 percent of the market for new vehicles in the U.S., according to Jessica Caldwell, the executive director of data strategy at Edmunds, an auto-market research and review site. It’s no secret why Americans are choosing trucks and SUVs more often. The job market is strong; unemployment stood at 4.1 percent in October. And gas has been relatively cheap, hanging below $2.30 a gallon for most of the last year. We’ve been here before. Not long after the turn of the millennium, gas was cheap and Americans were bingeing on it by buying big SUVs and pickup trucks. Then oil prices started to surge, and in 2008 when gas topped $4 a gallon, Americans suddenly learned to appreciate fuel-sipping sedans and smaller cars. But that moment is now a distant memory. At any rate, if you’re one of the remaining Americans who loves a good old-fashioned sedan, there’s good news. 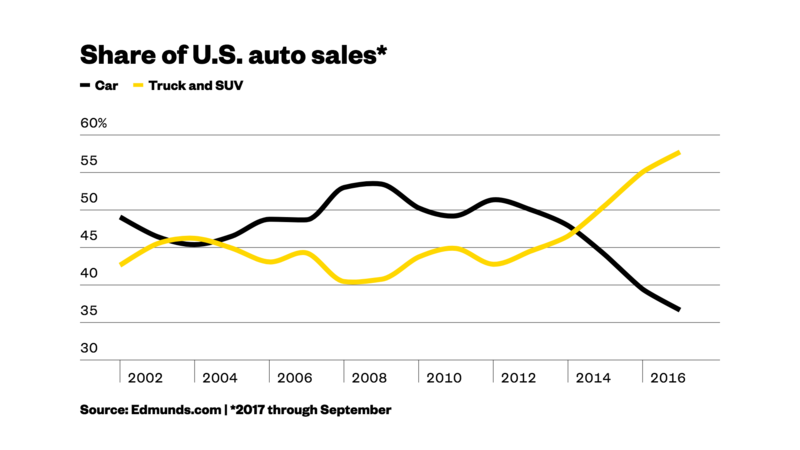 The strong swing back toward trucks and SUVs seemed to catch automakers somewhat off-guard, leaving them with large inventories of unsold sedans and other less-brawny vehicles. That’s pretty sweet if you’re in the market for a new car. Manufacturers are now scrambling to sell 2017 and even 2018 models, larding on large incentives like zero-percent financing and cash-back deals to entice buyers to take non-trucks off their hands. Tim Fleming, an analyst for Kelley Blue Book, said that automaker incentive spending is up to 10.4 percent of the average transaction price, compared to 9.5 percent at this time last year. According to Caldwell, automaker incentives hit their highest level on record in September. Incentive spending in the first three quarters of 2016 per car averaged $2,746, and that number has ballooned to $3,321 in 2017. Manufacturers are also responding to market pressure by “actively cutting vehicle production in segments where sales are slowest, which should help alleviate the pressure on discounting new cars,” Fleming added. In the meantime, if you’re in the market for an actual car — rather than a truck — the balance of power between buyers and sellers has definitely swung in your favor, at least for now. You might get a good deal.